We’re still gutted that the Harry Potter films are finished, but news that we can soon go behind-the-scenes of the Harry Potter films certainly goes some way to improving our mood! Warner Bros. 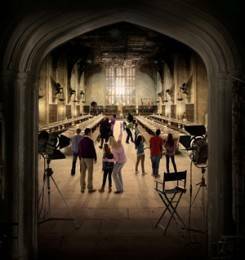 Studio Tour London – The Making of Harry Potter will give fans for the first time ever a unique behind-the-scenes tour of one of the biggest film series of all time. You’ll get to see the incredible size and detail of actual sets, costumes, animatronics, special effects and props that were actually used in all of the eight Harry Potter films. Warner Bros. Studios in Leavesden have been the home of the Harry Potter film productions for over 10 years, making it the perfect place to see the world of Harry Potter, as well as all the exciting talent and technology that went into making these films. And the attraction will have its Grand Opening on 31st March!